the Scout Sunday celebration we also are holding a banquet on May 12, 2018.
anyone knows of a boy that would be interested refer them to a scout leader. The United Methodist Church accepts the programs of Boy Scouts and Girl Scouts as contributing to the church’s goals in its ministry with children and youth. The Office of Civic Youth-Serving Agencies/Scouting of the General Commission on United Methodist Men recognizes men and women who give unusual amounts of time and energy in dedicated service with children and youth. The Cross and Flame program gives recognition to adult leaders who gave given exceptional service in the use of and promotion of programs for young people. Previous recipients of the Cross and Flame Award from Boy Scout Troop 14 include Arthur Altemose, Donald Cohick, Jr., John L. Confer, John M. Confer, Ernest Fisher, Douglas Foster, Harold (Skip) Hunsinger, Donald Mader, Paul McBride, Denise Springman, and Robert Weaver, Jr. 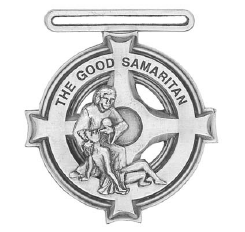 The purpose of the award is to provide United Methodist churches a means to recognize youth who demonstrate the attributes of the Good Samaritan as described in Luke 10: 25-37. The award recognizes ministry to others through outreach, humanitarian assistance, or advocacy. The candidate demonstrates significant personal and selfless contributions toward others or assistance to individuals in need. Boy Scout Troop 14 of St. John’s Newberry United Methodist Church was first organized as Troop 1 of Newberry, PA on January 22, 1918. With the establishment of the Williamsport Council, B.S.A. in our city in November of 1919, this Troop 1 of Newberry became Troop 14 of Williamsport, PA. The Williamsport Council later became the Lycoming County Council in 1928 and the West Branch Council in 1934. With the merging of the West Branch Council and the Sunbury Council in 1974, Troop 14 became part of the Lycoming District of the Susquehanna Council, B.S.A. serving five counties. Today we are part of the Bald Eagle District of the Susquehanna Council that serves Lycoming and Clinton Counties. This year, Troop 14 is able to celebrate 100 years of providing scouting to boys in the Newberry and surrounding area. Troop 14 has been chartered to Saint John’s, and now Saint John’s Newberry United Methodist Church for all 100 consecutive years. It has been through the efforts of many that the Troop has been and continues to be an active and strong unit. We celebrate our scouting heritage. We look forward to continued success in the coming years.